The ACTIVATE Fit Pro Experience is an exclusive opportunity for Health and Fitness Professionals to obtain continuing education in Ottawa, ON. With a team of leading industry presenters, the ACTIVATE FitCon will allow professionals to learn the latest research, re-ignite their passion, network with peers, invest and grow their business and/or themselves. This premiere event includes interactive workshops, seminars and master classes in the areas of personal training, program design, business development, performance, mind/body, nutrition, movement, assessments, and more. Our inspiring keynote presentation will empower you, to continue empowering others. Finally, the marketplace expo is a great place to connect, shop the latest trends, meet local businesses and find some exclusive deals. So many great opportunities to fill your “tool box” – from new techniques and protocols to new equipment…we have you covered! Each participant will receive a certificate of completion, as well as pre-approved CEC credits from our CEC alliance organizations, *such as canfitpro, NSCA, CPTN, YMCA, and IONC. 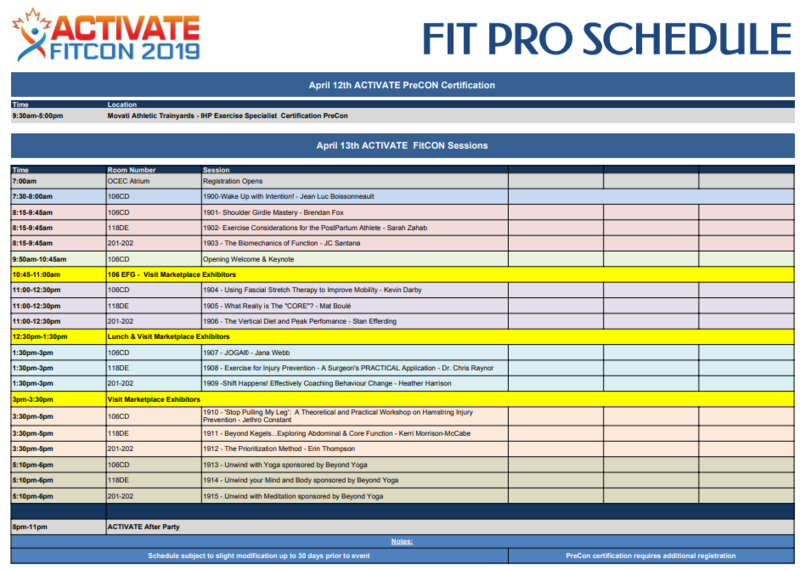 In addition to CEC workshops and seminars, ACTIVATE provides a unique opportunity for personal trainers and fitness instructors to obtain top certifications with PreCons, in partnership with leading education facilitators. KEYNOTE. KEYNOTE, KEYNOTE! 📣Introducing the incredible Carole Woodstock! Join Carole on April 13th [Closed], as she shares her journey, her recovery, her tips and her inspiration with you. ⚠️This keynote presentation is exclusive to all registered ACTIVATE FitCon 2019 delegates! Functional Training, Hypertrophy, Mobility, Flexibility, Strength, Power, Speed…SO many disciplines of training! Do you ever feel overwhelmed and confused with the various areas of focus, when designing a program for your clients? JC Santana has mastered this program design, and has been applying his exclusive ‘Hybrid Program Design’ for over 20 years. From World Class fighters, Pro Athletes, US Navy Seals, to the average client, this system is the gold standard in human performance, and pulls it all together. The Institute of Human Performance (IHP) EXERCISE SPECIALIST certification provides the student with a thorough understanding of IHP’s world-renowned training system – from true functional training, traditional lifting and mobility integration…all in one hybrid training methodology. This course includes hot personal training concepts and strategies, such as relevant definitions in functional training, how IHP uses modern periodization strategies to create unique programs specific to the personal training industry – including one on one and small semi private sessions. Whether you are a veteran personal trainer, or just starting out, you will walk away with incredible material, that is both theoretical and practical. Learn the 4 pillars, program design, biomechanics and much more. This Applicable education that will open the door to a whole new world! This Certification has a mandatory online learning component, followed by a full day “LIVE” session with JC Santana on April 12th, 2019. Once the online and live sessions are complete, you can then challenge the online exam (up to 120 days) in order to obtain your IHP EXERCISE SPECIALIST certificate, directly from IHP. Regular price of this certification is over $999 USD. Grab this exclusive Canadian opportunity now. Limited space is available! The ACTIVATE FitCon is a multi-organization CEC accredited event. 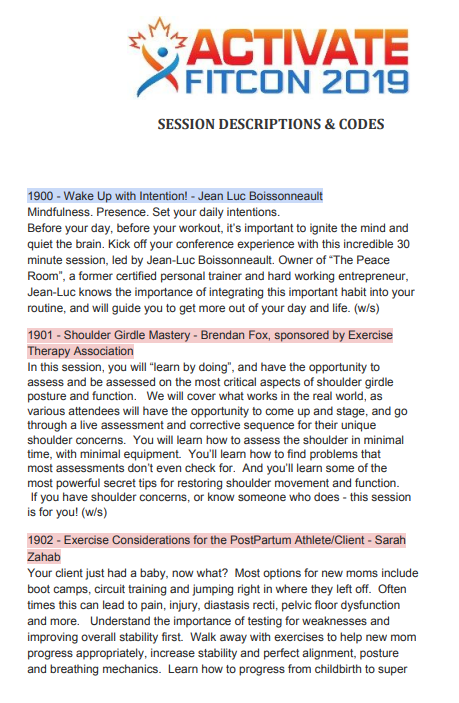 In order to qualify for a full CEC certificate, you must register for the full day FitCon. For your reference, the chart below outlines how many credits are allotted per session. I have provided fitness and resilience training to nearly one million people over the past seven years, both military and civilian. I feel blessed and honored to have worked with Connie Beaulieu at ACTIVATE Fitness Summit and Consumer Expo. She expressed herself with an immense amount of intestinal fortitude, inspiration and integrity, like some of the brightest and boldest Warriors that I have served with during my 34-year career with the US Army. Her vision to change lives through physical and emotional wellness is something that I admire a great deal. Whether it is the expert exercise education or highly effective life coaching, I am completely confident that everyone who attends her events will leave ACTIVATE’d and empowered like never before!